Nonprofit organizations continue to grow in number and influence the implementation of public policies, vitality of civil society, and global economy. The little research or literature available on the use of performance measurement as a strategic tool in assessing nonprofit organizations' effectiveness in the accomplishment of their missions poses a general problem. 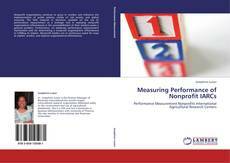 Furthermore, no adequate performance measurement mechanisms exist for determining a nonprofit organizations' effectiveness in fulfilling its mission. Nonprofit leaders are in continuous quest for ways to explain, predict, and improve organizational effectiveness.